I often scour the web for vintage and i find it so interesting how some items can go undetected and how other sell for hundreds of dollars or hit their reserve within minutes of going out to bid. As a business owner I often have to take my buying experience and build that into your shopping experience. The one thing that any online company will tell you, is that the product photos need to be clear and cohesive for a shopper to click on it. My best friend when shopping is that disgustingly bad photo that no one wants to click on. I live and breath for those ugly photos. Which is exactly why I choose this Dela-Ann Creations Hostess Dress to feature for this post. I will have to admit that at first, I passed this dress by. The photo was so bad and had a yellow tint to it but after a few minutes of searching something told me to go back to the dress. It had zero bids and just over an hr until the bid ended so I clicked and I am so glad I did. Look at how beautiful she is. I have lots of favorites when it comes to the Dela-Ann dress but my absolute favorite is the pockets. I am a sucker for a dress or skirt with pockets. I don't often want to switch out purses or even bring one so pockets are ideal. But in my experience pockets only work on heavier fabrics as the contents in your pockets stick out too far if the fabric is too light. My second favorite part of this dress and yes even i am surprised its not my favorite is, the skirt. The colors are to die for. The colors and the design are bold and scream 60/70's. 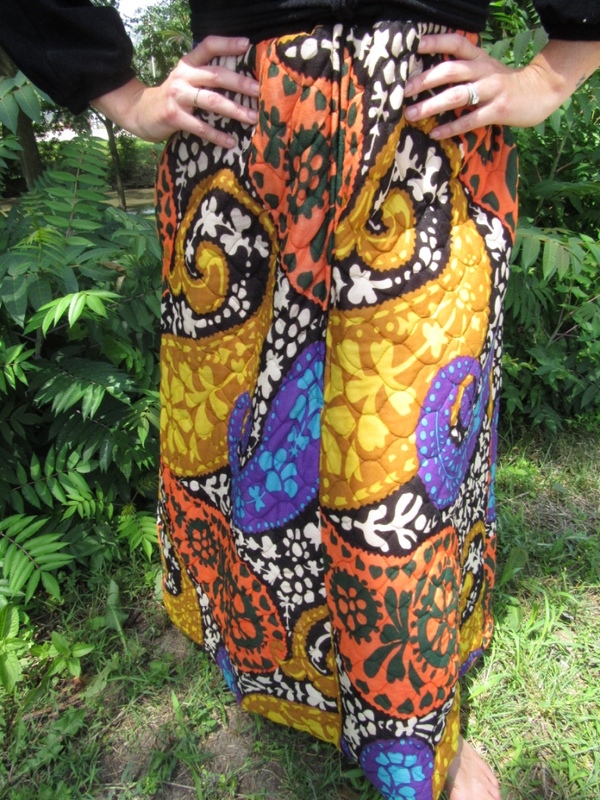 What may be difficult to see in the photos is that this skirt is quilted. So, its super soft and great for those cooler seasons. God bless Meghan for humoring me and wearing this dress in August. Love ya girl(kisses). Now another neat detail is the detailing on the zipper pull. Its so retro and I can just imagine wearing this and having a dinner party with hard drinks that require olives or sugar cubes and music playing on the record player and finger foods being passed around. You know...when times were a little more simple and good conversation is all one needed to get dressed up and to have a get together. All without leaving the house. Another win, win for this dress is that its a size 16. Vintage is difficult to find in plus size or even a average size and this dress is true to size, even with todays sizing charts. It also has a built in belt that ties so its perfect for adjusting to different body types. So, as you can see, I love this dress and I am so happy that the original seller had lower quality photos and that I was able to gobble up this beautiful piece of history and share it with the world. Thank you for taking time to read my blog. Please leave me a comment below and let me know if there is anything that you would like me to cover as a fashion blog topic.